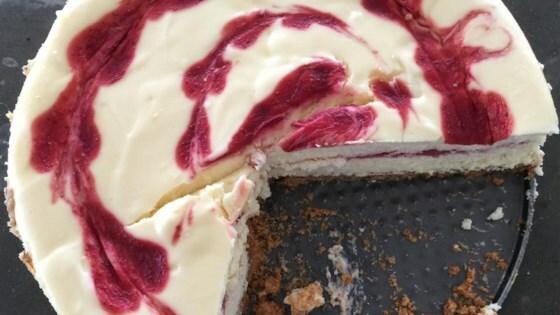 "This creamy strawberry cheesecake is perfect for any special occasion! You have to bake the cake and let it cool for an hour, then chill it in the refrigerator for at least 4 hours prior to serving." Combine graham cracker crumbs, sugar, cinnamon, and butter in a bowl. Press onto the bottom of an ungreased 9-inch springform pan. Refrigerate for 30 minutes. Bring to a boil over high heat. Boil and stir until sauce is thick and shiny, about 2 minutes. Set aside 1/3 cup strawberry sauce; cool. Cover and refrigerate remaining sauce for serving. Beat cream cheese in a mixing bowl with an electric mixer until light and fluffy; gradually beat in condensed milk. Mix in lemon juice and vanilla extract, then beat in eggs on low speed until just combined. Pour half of cream cheese mixture over crust; drop half of reserved strawberry sauce by 1/2 teaspoonfuls on cream cheese layer. Carefully spoon remaining cream cheese mixture over sauce; drop remaining strawberry sauce by 1/2 teaspoonfuls on top. Cut through top layer only with a knife to swirl strawberry sauce. Bake in preheated oven until center is almost set, 45 to 50 minutes. Cool on a wire rack for 10 minutes. Carefully run a knife around edge of pan to loosen; cool 1 hour longer. Refrigerate overnight. Serve reserved strawberry sauce with cheesecake. If the sauce it too thick, stir in water. It didn't look awful, but tasted terrible. Amazing cheesecake!!! Turned out perfect on the first try!! Didn't change a thing!! Definitely will add this to my recipe box. Thanks for adding! !